It took me two different screenings to fully absorb Pirates of the Caribbean: On Stranger Tides, one being a midnight screening and the other being a repeat screening with my Dad (it’s one of my favorite traditions). I actually had a chance recently to re-watch the trilogy, and the latter two still stand out as my favorites. I really dug the supernatural parts of the story like Davy Jones and his crew and how things slowly built toward that colossal, one-hour scuffle between the Dutchman, the Black Pearl, and the East India Trading Company. Sure, the plot’s pretty pressed even at three hours, but it was still a larger-than-life conclusion to one of my favorite “trilogies” growing up. Now, even with Keira Knightley and Orlando Bloom gone, we find ourselves at a fourth installment. As with any fourth installment where you’re breaking free of your “told and done” story of your trilogy, by the time the ending credits go up the viewer has to ask, “was it worth it, or should they have stopped while they were ahead?” Unlike a lot of other franchises, I’d like to think Pirates of the Caribbean has more longevity than other series. I could almost picture an elderly Geoffrey Rush opening up his storybook entitled “The Many Adventures of (Captain) Jack Sparrow” to tell his grandchildren of the many stories, all while sitting next to an open fire in a wingback chair. After defeating what was essentially the high sea’s equivalent of Satan and the Turners are out of the picture, Jack Sparrow, his First Mate Gibbs, and Privateer Captain Barbossa, now working for the Royal Navy, are all out to find the mythical Fountain of Youth. One of the reasons the second film in the series, Dead Man’s Chest, is still my favorite is because there’s one central goal in that film to find the chest of Davy Jones. We’re told whoever finds the chest essentially owns the sea, and no matter what’s going on it’s always going back to that main objective. I was relieved to find On Stranger Tides works on that same level in a sense, although things are a little bit twistier along the way. Johnny Depp returns of course as Captain Jack Sparrow, and it feels a bit redundant to talk about his performance. Sure the character’s starting to show its age, but you can’t hide that smile on your face seeing this man’s mastery of the myth that is Sparrow, he just believes in it so much, probably even more so since he was more than likely paid more to come back for this round-about. While Kevin McNally has had better turns as Gibbs, Jack’s best friend, his determination is really admired. If you’ve ever seen Geoffrey Rush in an interview or in another role and then watched a Pirates of the Caribbean film, you’ll swear you’re seeing a different person. It’s really a shame this guy hasn’t been recognized yet for this awesome role especially after four films. Even if he’s pushing his later 60s, it’s inspiring to see this guy put so much effort forth as Barbossa, and it pays off as he’s still the most developed character on the screen. Just that laugh of his in the final five minutes of the movie brings me back to 2006 where he made a similar “comeback” that caused a few gasps. Now I’ll go ahead and pick this bone, that the exclusion of certain Black Pearl members was noticeable. I can’t really blame the writers for not having the Turners in the film anymore considering how their story ended in At World’s End, but the fact that Pintel and Ragetti are nowhere to be found in this film is by far it’s biggest sin. There’s a story twist revealed at the end that potentially explains their absence, but it’s sort of like having a college graduation party where the two funniest guys from your dorm hall didn’t show up. Ian McShane joined the cast this time around as the main villain of the film, the dreaded Blackbeard. He does a pretty serviceable job as the nasty, remorseless pirate, but it’s a pretty tough act to follow Bill Nighy’s impeccable definition of Davy Jones. Penelope Cruz pops in as the former love interest to Jack/swash-buckling heroine Angelica, and gives the screen plenty of pop as a great piece of eye candy. She also fits into the whole mesh of the Pirates lore remarkably well. Along with Cruz and McShane are a slew of new concepts to the film. I’ll concede that a lot of these ideas work, but certain structures just aren’t set up and followed through on. I had a lot of fun with the new mermaid subplot to the film, and I think there was a good amount of focus put into that on a writing level. The mermaid attack scene that’s shown a lot in the trailer isn’t quite as memorable as I’d like, but is creepy and diverse enough to warrant the inclusion. A lot of my friends that have seen the film liken the new characters to “mermaid vampires”, and without getting too nerdy on what exactly constitutes a vampire, that pretty much hits the nail on the head. They mold this idea together with our new “replacement” for Will Turner, a missionary that’s been imprisoned on Blackbeard’s ship that ends up “fancying” the mermaid Blackbeard imprisons for the Fountain voyage. While the romance never really meant a whole lot to me and I never really became that invested in it, it does have its sweet moments here and there that help it stay relevant and interesting, even if that particular story ends in a head-turning way that I won’t spoil here. Like I went over earlier Blackbeard is a pretty convincing villain mainly thanks to McShane’s own ability as an actor, but aside from a few moments of the film we’re never really given that much reason to be afraid of him. Sure, his boat has a flamethrower, and sure, he controls his ship with his sword and can bring the dead back to life, but aside from a few novelty moments you’ll wonder what the big deal is about “the pirate all pirates fear”. These ideas aren’t executed poorly by any means, but they lack some of the legroom we got with some of the newer notions from the other movies. This also sort of comes back to the script that handles a few of these plot developments a little clumsily. With Barbossa’s story we’re never really given a reason he’s working for the British Navy until the climax of the film, which adds a little too much mystery to his character, if that’s even possible. There also aren’t many stakes for Jack Sparrow this entire time; he’s almost an observer to a lot of the action. There are a few other plot contrivances that feel just a little phoned-in with this being a fourth installment and all. But for every new plot element that didn’t really feel all the way developed, there were some awesome inclusions like the Spanish Conquistador involvement that takes a surprise turn near the end or just how beautiful some of these new sets looked, in particular Blackbeard’s rust-colored ship. The film also hits the nail on the head in capturing the Pirates of the Caribbean humor that always keeps things at a level, energetic tone. In Pirates of the Caribbean 1-3 there was always one big set piece that I enjoyed, whether that was the water wheel chase in Dead Man’s Chest or the hour-long Maelstrom Battle in At World’s End, but I didn’t find that to be the case in On Stranger Tides. There are a handful of cool action moments, but never one that stood out more than the others aside from the London chase at the film’s intro. I did have way more fun with this than I thought I was going to, but the thought of considering what this series would have been like at just three films crossed my mind a time or two. I don’t think the film is as “unnecessary” or “lazy” as a lot of people seem to point out, I think it’s worth it’s weight in fun and intrigue. It has its moments of slothfulness that’s come to be expected when a series is practically a decade old, but it never became so apparent that the film lost its zeal to me. In the end I think that’s what charmed me most, the enjoyable and often “storybook” characteristics of the film. I wouldn’t call Pirates of the Caribbean: On Stranger Tides a “great” film, but it’s definitely “good”, and it succeeds in pleasing its swash-buckling, pleasure-seeking audience including myself. It does have it’s fair share of problems, but most of them just came back to what appears to be conflict on a writing level where there seemed to be trouble deciding where to take the series now. While it’s showing it’s age, for a fourth installment it’s not half bad. I could see them doing this series on for at least a handful of other films, whether that’s continuing off of the post-credits chin-scratcher or, as I would prefer, having Captain Jack go on other quests for Pirate lore and booty. Heck, I’d even watch a film with just Geoffrey Rush in it as Barbossa. Who knows, the next Pirates go-round might just be its finest if they keep preserving the film’s fun nature it’s held onto so well, but work a little bit more on how they incorporates the new ideas that’s keeping it so fresh. Keep all these things in line and I’d be sorely remiss to ever walk the plank, that is unless you don’t brink back Pintel and Ragetti. Three years ago on a rainy Friday night I sat in a semi-crowded theater and saw Jon Favreau’s larger-than-life adaptation of Iron Man. It wasn’t just the first film I was able to drive myself to go see, but it was also one of the single coolest theater-going experiences of my life. Something clicked that night. Maybe it was the overwhelming sense of freedom that came in the form of seeing a mega-blockbuster with my new driver’s license, maybe it was Robert Downey Jr.’s charisma that just melted off of the screen, or maybe it’s just because I like watching superheroes duke it out with other superheroes and seeing metal bang against metal, but that experience in that theater, including squealing in nerdy delight as Samuel L. Jackson stepped on the screen for the first time as Nick Fury to introduce the Avengers initiative, will be one that I hopefully never, ever forget. Three years and billions of dollars later, we’ve seen 1/2 the Avengers assemble with the inclusion of “The Incredible Hulk” (an entertaining, although flawed experience) back in 2008, and now in one summer we’re “assembling” the final half of the best crime-fighting team in the universe, The Avengers. Now that we have less than a year before Will Wheaton’s carefully handled, meticulously written, and ceremoniously protected take on Marvel’s “best of the best” hits the screen, people are getting nervous. Both Iron Man and the Hulk are big successes, and now not only does the currently filming “Avengers” obviously have to be a hit, but the two precursors, Captain America and Thor have to be a success or Marvel’s biggest project ever will be sitting on some shaky ground. Sure, Captain America makes me nervous because you have the hit-or-miss director Joe Johnston on a character who’s tone and subject matter you have to hit just right, but then there’s Thor, which on paper could either be a humiliating disaster or a daunting inspiration as to what Marvel can really do. Before the incredible buzz came rolling in I was convinced Thor was going to be the former, a film that can’t manage the formality of Asgard and the light-heartedness of Earth that balances the character out for the casual audience. I’ve never been happier to be wrong about a movie, because this is an unbelievable pairing of dedicated performances and a clear direction that knew from the get-go what it wanted to be. All together it’s a film that doesn’t just settle for being fun, but a very intelligent yet consistently entertaining jump start to Summer 2011 that rivals the quality of the classic that is Favreau’s 2008 Iron Man. The film is basically one of the sleekest origin stories ever, telling the wide tale of Thor (Chris Hemsworth), an arrogant king-to-be that is banished to earth by his father Odin (Anthony Hopkins) after starting a needless war with the neighboring Frost Giants. The film follows his quest on earth to prove himself to be a noble warrior by helping a local scientist (Natalie Portman) while his brother, the mischievous Loki, has some evil plans for the throne of Asgard. Let me start by saying the decision to put Kenneth Branagh, former helmer of Shakespearean projects like Henry V, as the head of Thor (arguably the most Shakespearean superhero ever created) was one of the most inspired creative decisions since Raimi was put on Spiderman or Favreau was assigned to Iron Man. Everything about Asgard looks spectacular, from the costumes all the way down to the rainbow road. There’s some apparent pain-staking detail in the costumes of Asgard’s residents including Thor and even the Warriors Three, and it brings out a very genuine aesthetic to the characters. Not to mention the simple fact that the costumes just look cool. As I mentioned earlier, Branagh is a Shakespearean vet, and it shows in some of the beautiful Asgardian sets. The dining halls, Odin’s sleeping chambers, heck even the more mystical elements like Rainbow Bridge, the Observatory, and the countless breathtaking shots of the city itself look like they were taken straight out of one of Shakespeare’s finest tales. Although less elegant, the small town Thor is banished to in New Mexico is also just as beautiful in a much different, more subtle way. It almost reminded me of my own small hometown, having a very compact feel that worked to both give you an very easy-to-grasp concept of location and to give even more weight to how out of place a mystical god like Thor really is. Matching up with these striking sets are some just-as-striking performances. Being the Anthony Hopkins fan I am, I found a lot to enjoy in his portrayal of Odin, even if it’s your standard Hopkins fare. Tom Hiddleston doesn’t quite knock it out of the park as Loki, but he’s menacing enough to keep your attention without necessarily breaking down genre standards, and both Natalie Portman and Kat Dennings are fun distractions during Thor’s stay on Earth. Idris Elba has a fun bit in the film as the gatekeeper and with his 20 minutes of screen time proves he’s ready for bigger parts. (Possibly Luke Cage anyone?) It’s Chris Hemsworth as our title character Thor that truly sets the film apart. While Hemsworth might give off the classic Hollywood meathead stereotype, the way he visibly dedicates himself to the role is awe-inspiring, and it’s something we haven’t seen the likes of since Robert Downey Jr. perfectly encapsulated the part of Tony Stark. Hemsworth’s bravado, the way he convincingly pulls off the Shakespearean drama, the Marvel big league action, and most surprising of all the hilarious nature of his character that there’s not a single doubt in my mind Hemsworth isn’t destined for greatness. I’ve heard different critics even compare him to 1977 Harrison Ford, and while that’s a high bar to set, Hemsworth is for sure within reaching distance of that. Needless to say I can’t wait to see what’s next for this guy aside from The Avengers and the almost assured Thor sequels. There’s nothing quite as exhilarating as seeing an actor on screen as their character for the first time in the film, and, having had all of these pre-conceived notions as to what they should look like, how they should sound, and how they should behave, seeing them knock it out of the park, leaving you with your jaw on the floor. thought I would laugh so hard at a Norse god being hit by a car multiple times or the old face-smearing on a window trick we’ve seen abused so many times. The fact that the humor, action, and drama not only work, but excel and genuinely blend to make one cohesive result that’s so much fun to watch makes it one of Marvel’s finest and most impressive achievements to date. I’m also impressed that there was a good bit of effort into putting a lot of emphasis on his fierce rivalry with Loki that makes some of the film’s later scenes and even where we’re led to assume that character is going even more exciting. There’s also a lot of apparent respect for the source material here, thanks once again to Branagh’s filmography and I’m sure the other immense talent behind the camera. Thor, despite being one of Marvel’s B-Level heroes, is treated with as much respect as Spiderman or Iron Man, and while his arc is similar to Tony Stark’s in Iron Man 1, there are plenty of moments that give you genuine time to get to know Thor, his complicated relationships with Loki and Odin, laugh with him and even sympathize with him. As if the developed character wasn’t enough, the aforementioned beauty in the sets and costumes also does its fair share of showing the respect to Asgard’s finest. While I was a little disappointed at first at Thor’s $66 million opening weekend in America (almost half of Iron Man 2’s opening on the same weekend last year), the film is thankfully not a financial failure, mainly due to two facts. A) The film is based off of a very minor superhero, and it’s honestly a darn hard film to sell, and B) the movie is doing gangbusters overseas, making it’s budget back worldwide by the end of its first weekend here in America, almost guaranteeing a sequel that can do even better on U.S. shores. While staring at awe at the screen, I was dumbstruck thinking about how only in 2011 could we have made a film like this. Not just from a marketing point of view in that you just couldn’t sell a film like this 20 years ago in a cinema world dominated by straight-laced action conceits, but also from a visual effects point of view. The visual effects in Thor, not just from an artistic point of view but also just from sheer powerhouse standards are top of the line phenomenal. Thor’s metallic opponent “The Destroyer” that’s showcased heavily in the trailers and TV spots could pass off as a practical prop a few times in the film, and a number of effects including the rainbow bridge featured heavily in the final act look so real you’ll almost believe there’s a rainbow bridge out there somewhere. It goes without saying I’m thankful for the Thor film we have now. One thing that bothered me about last year’s summer opener Iron Man 2 was how heavy-handed a lot of the Avengers elements felt that were obviously shoehorned into Favreau’s script, and the film was undeniably more unorganized because of it. Thor on the other hand feels supremely more natural with its Avengers sub-plots, obviously designed from the get-go to showcase the inner workings of S.H.I.E.L.D. and Agent Coulson. Their main involvement in the story (excluding the bone-chilling after-credits scene) actually is relevant to Thor’s main objective in the film and thankfully the film never forgets what it’s about, Thor, instead of the group Thor’s planning to join. Thankfully they also have fun with it, poking fun at the group’s ridiculously secretive nature, making very subtle references to Iron Man and The Incredible Hulk that will get fans excited but not confuse the casual viewer like Iron Man 2 did, providing what is possibly my favorite Stan Lee cameo, and even an extended appearance by an until-now-unseen member of the Avengers. Not to give too much away, but the solid 2-3 minutes we see this new character took me all the way back to that semi-crowded theater in 2008 seeing Samuel L. Jackson for the first time in that Nick Fury get-up. After the semi-disappointment of Iron Man 2, Thor, bringing two of its members to the screen at once, makes me incrementally more excited for next year’s cream of the crop, The Avengers. Thor is a film that can stand on its own as a fantastic piece of entertainment even if 2012’s The Avengers fails, mainly because the main priority of the film is always teaching us more about Thor. 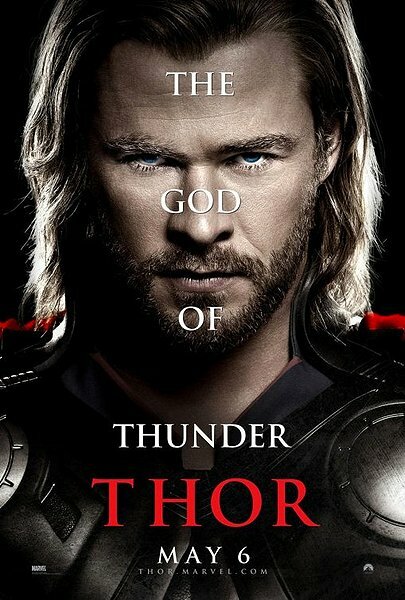 If there’s anything Thor does wrong, it’s being almost too fast of a film. The movie’s less than 2 hours long, which is totally effective in keeping the kiddies’ attention, but I just know with an extra 1/2 hour padding there would have been more time spent on the love interest relationship between Thor and Jane and even more slower stuff between Thor and Odin. By the time things get going it felt like they were already winding down to the big climax, which was kind of a bummer for me. On one hand there were certain elements that could have used more time, but also a pretty serviceable compliment to the film that I wasn’t ready to leave the world they created. The week before I was able to finally see Thor was a long one. Aside from my crippling anticipation for the film after hearing fantastic word of mouth for it, it was also my finals week at my university and I was having to endure a lot of tests that were going to decide if all of my hard work that semester was for naught. Having passed all of my finals and getting the grades I needed to in order to hold onto my scholarships that basically decide if I get to keep going to my university, Thor was hopefully going to be a fun release, a sharp tack to my balloon of stress. I’m so elated to be able to say Thor was all of that and more. It’s really a phenomenal piece of entertainment that doesn’t just rely on being dumb and fun summer popcorn entertainment like it easily could have been, but it’s an expertly crafted film that’s lovingly dedicated to fans of the genre. Most astounding of all is that amidst all the balancing acts of Earth and Asgard, the side splitting comedy and the stirring performances it never forgets to be a fun film the Summer’s known for. It’s going to be a film that I yearn to re-watch again and again when this Fall rolls around and I need stress relief from my new classes, and I firmly believe will stand in my memory much like Iron Man 1 did 3 long years ago. All I wanted was a fun film last Saturday night, what I got in return from Hemsworth and the Marvel gang was surely a gift from the gods.